A chalazion is a hard bump that forms on the eyelid. 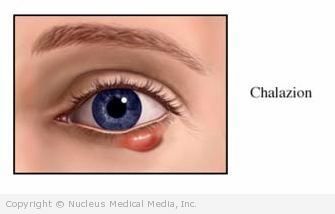 A chalazion can form when the duct leading from the meibomian gland to the eyelid becomes blocked. This gland produces an oily substance that lubricates the margins of the eyelid and the front of the eye. When the duct becomes blocked, the secretions from the meibomian gland harden. This causes a chalazion to form near the edge of the eyelid. This condition can become chronic. Your doctor will ask about your symptoms and perform an eye exam. Rarely, a sample of fluid from the chalazion is taken and tested in a lab. Self-care — A warm compresses is applied to the affected eyelid several times a day. Medication — Corticosteroid is injected into the chalazion. This is done by an ophthalmologist, but is rarely required. Topical antibiotics can be used if a secondary infection of the chalazion develops.